Below I transcribe some school records from the Westminster Jews Free School (obtained from Ancestry.com) referencing a Nelly and Bella Newmark. Are they the sisters of my great grandfather, Barney? Quite Possibly. If it is them, it provides the earliest record of their dates of birth - and neither date provided matches later records. Name and Address of Parent or Guardian: 36 Broad St. Golden Sq. 1. Dates of Birth: Since the Polish birth records haven't yet been found, this would be the earliest document with their dates of birth if we accept this as them. Later records indicate Bella was born on March 14, 1890. This document states March 4, 1889. It's not uncommon for a year to be subtracted from someone's age. The similarity in month and date reinforces the likeliness of this being a match. Later documents indicate a date of birth for Nelly of March 1889, this document states December 25, 1886. This is a significant difference. However, the 1901 UK census indicates a 2-year difference between sisters and ages that correspond with the document above. 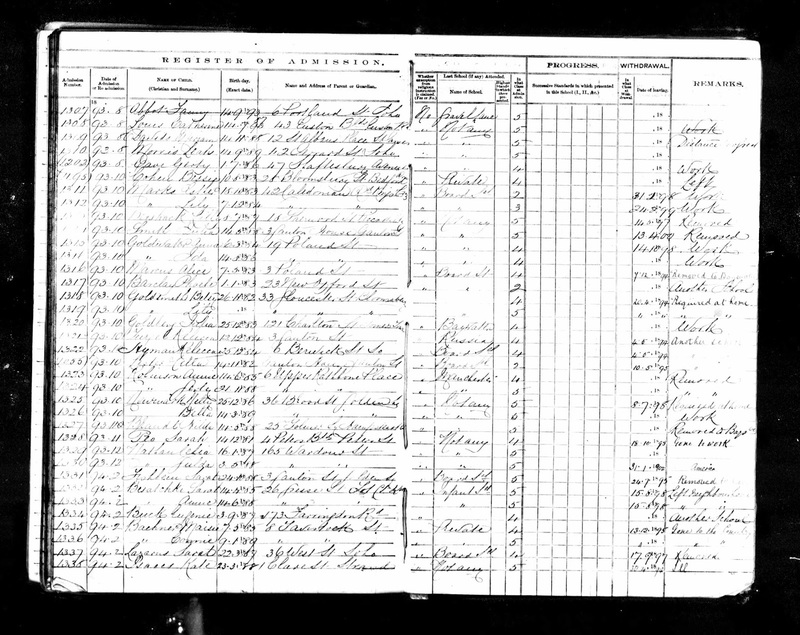 Alone, the 1901 census wasn't enough to suggest the family records were wrong. Mistakes by census takers are common. But this document seems to confirm the 1901 census with respect to age differences, and the census seems to confirm this document is for the same Nelly and Bella. If Nelly was born in December of 1886, and my great grandfather was born in March of 1886, there was nine months difference between them. 3) Below is a current map of the Soho area with the addresses marked where I now know my second great grandparents and their family lived between 1893 and 1908. They lived at 55 New Compton in 1894 and 1895, and at 56 Wells Street in 1901 and 1904. It's not clear from the above document whether they lived on Broad Street in 1893 when Nelly and Bella were enrolled, or 1898 when they left. Hanway Place is where the Westminster Jews Free School was located. Broad Street changed its name to Broadwick. #36 would have been on the corner of Poland Street. #28 Broad Street was the birthplace of poet, William Blake. 4) The book of records this page comes from lists only the girls admitted 1868-1896, in admission order. The order suggests the address would apply to admission date. If that is the case, the Newmark family didn't remain long on Broad Street, since they were at 55 New Compton Street by November of 1894 when Kate was born. There doesn't appear to be a companion book online yet for boys. Though Ancestry notes that the records come from the London Metropolitan Archives, which could have additional records.